Its corrosiveness can be mainly ascribed to its strong acidic nature, and, if at a high concentration, its dehydrating and oxidizing properties. It is also hygroscopic, readily absorbing water vapor from the air. 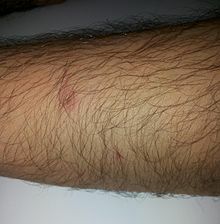 Upon contact, sulfuric acid can cause severe chemical burns and even secondary thermal burns; it is very dangerous even at moderate concentrations. Sulfuric acid is a very important commodity chemical, and a nation's sulfuric acid production is a good indicator of its industrial strength. It is widely produced with different methods, such as contact process, wet sulfuric acid process, lead chamber process and some other methods. Sulfuric acid is also a key substance in the chemical industry. It is most commonly used in fertilizer manufacture, but is also important in mineral processing, oil refining, wastewater processing, and chemical synthesis. It has a wide range of end applications including in domestic acidic drain cleaners, as an electrolyte in lead-acid batteries, and in various cleaning agents. 7 is a solid with melting point of 36 °C. Pure sulfuric acid has a vapor pressure of <0.001 mmHg at 25 °C and 1 mmHg at 145.8 °C, and 98% sulfuric acid has a <1 mmHg vapor pressure at 40 °C. Pure sulfuric acid is a viscous clear liquid, like oil, and this explains the old name of the acid ('oil of vitriol'). 4 is impure and often colored, but is suitable for making fertilizer. Pure grades, such as United States Pharmacopeia (USP) grade, are used for making pharmaceuticals and dyestuffs. Analytical grades are also available. Nine hydrates are known, but four of them were confirmed to be tetrahydrate (H2SO4·4H2O), hemihexahydrate (H2SO4·​6 1⁄2H2O) and octahydrate (H2SO4·8H2O). 4 is a very polar liquid, having a dielectric constant of around 100. It has a high electrical conductivity, caused by dissociation through protonating itself, a process known as autoprotolysis. The comparable equilibrium constant for water, Kw is 10−14, a factor of 1010 (10 billion) smaller. 4 ions are high due to an intramolecular proton-switch mechanism (analogous to the Grotthuss mechanism in water), making sulfuric acid a good conductor of electricity. It is also an excellent solvent for many reactions. Drops of concentrated sulfuric acid rapidly decompose a piece of cotton towel by dehydration. An experiment that demonstrates the dehydration properties of concentrated sulfuric acid. When concentrated sulfuric acid comes into contact with sucrose, slow carbonification of the sucrose takes place. The reaction is accompanied by the evolution of gaseous products that contribute to the formation of the foamy carbon pillar that rises above the beaker. 4 is the sulfate anion. Ka1 and Ka2 are the acid dissociation constants. Because the hydration of sulfuric acid is thermodynamically favorable and the affinity of it for water is sufficiently strong, sulfuric acid is an excellent dehydrating agent. Concentrated sulfuric acid has a very powerful dehydrating property, removing water (H2O) from other chemical compounds including sugar and other carbohydrates and producing carbon, heat, and steam. In the laboratory, this is often demonstrated by mixing table sugar (sucrose) into sulfuric acid. The sugar changes from white to dark brown and then to black as carbon is formed. A rigid column of black, porous carbon will emerge as well. The carbon will smell strongly of caramel due to the heat generated. 2, which is important in nitration reactions involving electrophilic aromatic substitution. This type of reaction, where protonation occurs on an oxygen atom, is important in many organic chemistry reactions, such as Fischer esterification and dehydration of alcohols. Dilute sulfuric acid reacts with metals via a single displacement reaction as with other typical acids, producing hydrogen gas and salts (the metal sulfate). It attacks reactive metals (metals at positions above copper in the reactivity series) such as iron, aluminium, zinc, manganese, magnesium, and nickel. 4 ions are evolved instead of the hydrogen and salts. It can oxidize non-active metals such as tin and copper, depending upon the temperature. Lead and tungsten, however, are resistant to sulfuric acid. Hot concentrated sulfuric acid oxidizes non-metals such as carbon (as bituminous coal) and sulfur. Pure sulfuric acid is not encountered naturally on Earth in anhydrous form, due to its great affinity for water. Dilute sulfuric acid is a constituent of acid rain, which is formed by atmospheric oxidation of sulfur dioxide in the presence of water – i.e., oxidation of sulfurous acid. Sulfur dioxide is the main byproduct produced when sulfur-containing fuels such as coal or oil are burned. When iron(III) oxidation of pyrite occurs, the process can become rapid. pH values below zero have been measured in ARD produced by this process. ARD can also produce sulfuric acid at a slower rate, so that the acid neutralizing capacity (ANC) of the aquifer can neutralize the produced acid. In such cases, the total dissolved solids (TDS) concentration of the water can be increased from the dissolution of minerals from the acid-neutralization reaction with the minerals. Sulfuric acid is used as a defense by certain marine species, for example, the phaeophyte alga Desmarestia munda (order Desmarestiales) concentrates sulfuric acid in cell vacuoles. Because sulfuric acid reaches supersaturation in the stratosphere, it can nucleate aerosol particles and provide a surface for aerosol growth via condensation and coagulation with other water-sulfuric acid aerosols. This results in the stratospheric aerosol layer. Sulfuric acid is produced in the upper atmosphere of Venus by the Sun's photochemical action on carbon dioxide, sulfur dioxide, and water vapor. Ultraviolet photons of wavelengths less than 169 nm can photodissociate carbon dioxide into carbon monoxide and atomic oxygen. Atomic oxygen is highly reactive. When it reacts with sulfur dioxide, a trace component of the Venusian atmosphere, the result is sulfur trioxide, which can combine with water vapor, another trace component of Venus's atmosphere, to yield sulfuric acid. In the upper, cooler portions of Venus's atmosphere, sulfuric acid exists as a liquid, and thick sulfuric acid clouds completely obscure the planet's surface when viewed from above. The main cloud layer extends from 45–70 km above the planet's surface, with thinner hazes extending as low as 30 km and as high as 90 km above the surface. The permanent Venusian clouds produce a concentrated acid rain, as the clouds in the atmosphere of Earth produce water rain. The atmosphere exhibits a sulfuric acid cycle. As sulfuric acid rain droplets fall down through the hotter layers of the atmosphere's temperature gradient, they are heated up and release water vapor, becoming more and more concentrated. When they reach temperatures above 300 °C, sulfuric acid begins to decompose into sulfur trioxide and water, both in the gas phase. Sulfur trioxide is highly reactive and dissociates into sulfur dioxide and atomic oxygen, which oxidizes traces of carbon monoxide to form carbon dioxide. Sulfur dioxide and water vapor rise on convection currents from the mid-level atmospheric layers to higher altitudes, where they will be transformed again into sulfuric acid, and the cycle repeats. Infrared spectra taken by NASA's Galileo spacecraft show distinct absorptions on Jupiter's moon Europa that have been attributed to one or more sulfuric acid hydrates. Sulfuric acid in solution with water causes significant freezing-point depression of water's melting point, down to 210 K (−63 °C), and this would make the existence of liquid solutions beneath Europa's icy crust more likely. The interpretation of the spectra is somewhat controversial. Some planetary scientists prefer to assign the spectral features to the sulfate ion, perhaps as part of one or more minerals on Europa's surface. Sulfuric acid is produced from sulfur, oxygen and water via the conventional contact process (DCDA) or the wet sulfuric acid process (WSA). In the first step, sulfur is burned to produce sulfur dioxide. This is then oxidized to sulfur trioxide using oxygen in the presence of a vanadium(V) oxide catalyst. This reaction is reversible and the formation of the sulfur trioxide is exothermic. 7), also known as fuming sulfuric acid. The oleum is then diluted with water to form concentrated sulfuric acid. 3 in water is not practical due to the highly exothermic nature of the reaction between sulfur trioxide and water. The reaction forms a corrosive aerosol that is very difficult to separate, instead of a liquid. This is then oxidized to sulfur trioxide using oxygen with vanadium(V) oxide as catalyst. Another method is the less well-known metabisulfite method, in which metabisulfite is placed at the bottom of a beaker, and 12.6 molar concentration hydrochloric acid is added. The resulting gas is bubbled through nitric acid, which will release brown/red vapors. The completion of the reaction is indicated by the ceasing of the fumes. This method does not produce an inseparable mist, which is quite convenient. Sulfuric acid can be produced in the laboratory by burning sulfur in air and dissolving the gas produced in a hydrogen peroxide solution. Prior to 1900, most sulfuric acid was manufactured by the lead chamber process. As late as 1940, up to 50% of sulfuric acid manufactured in the United States was produced by chamber process plants. In early to mid nineteenth century "vitriol" plants existed, among other places, in Prestonpans in Scotland, Shropshire and the Lagan Valley in County Antrim Ireland where it was used as a bleach for linen. Early bleaching of linen was done using lactic acid from sour milk but this was a slow process and the use of vitriol sped up the bleaching process. Sulfuric acid is a very important commodity chemical, and indeed, a nation's sulfuric acid production is a good indicator of its industrial strength. World production in the year 2004 was about 180 million tonnes, with the following geographic distribution: Asia 35%, North America (including Mexico) 24%, Africa 11%, Western Europe 10%, Eastern Europe and Russia 10%, Australia and Oceania 7%, South America 7%. Most of this amount (≈60%) is consumed for fertilizers, particularly superphosphates, ammonium phosphate and ammonium sulfates. About 20% is used in chemical industry for production of detergents, synthetic resins, dyestuffs, pharmaceuticals, petroleum catalysts, insecticides and antifreeze, as well as in various processes such as oil well acidicizing, aluminium reduction, paper sizing, water treatment. About 6% of uses are related to pigments and include paints, enamels, printing inks, coated fabrics and paper, and the rest is dispersed into a multitude of applications such as production of explosives, cellophane, acetate and viscose textiles, lubricants, non-ferrous metals, and batteries. Ammonium sulfate, an important nitrogen fertilizer, is most commonly produced as a byproduct from coking plants supplying the iron and steel making plants. Reacting the ammonia produced in the thermal decomposition of coal with waste sulfuric acid allows the ammonia to be crystallized out as a salt (often brown because of iron contamination) and sold into the agro-chemicals industry. Sulfuric acid is also important in the manufacture of dyestuffs solutions. The sulfur–iodine cycle is a series of thermo-chemical processes used to obtain hydrogen. It consists of three chemical reactions whose net reactant is water and whose net products are hydrogen and oxygen. Step one of cycle is the Bunsen reaction. The sulfur and iodine compounds are recovered and reused, hence the consideration of the process as a cycle. This process is endothermic and must occur at high temperatures, so energy in the form of heat has to be supplied. The sulfur–iodine cycle has been proposed as a way to supply hydrogen for a hydrogen-based economy. It does not require hydrocarbons like current methods of steam reforming. But note that all of the available energy in the hydrogen so produced is supplied by the heat used to make it. The sulfur–iodine cycle is currently being researched as a feasible method of obtaining hydrogen, but the concentrated, corrosive acid at high temperatures poses currently insurmountable safety hazards if the process were built on a large scale. 3) which are then used to manufacture "new" sulfuric acid. SAR plants are common additions to metal smelting plants, oil refineries, and other industries where sulfuric acid is consumed in bulk, as operating a SAR plant is much cheaper than the recurring costs of spent acid disposal and new acid purchases. 2) can be added to sulfuric acid to produce piranha solution, a powerful but very toxic cleaning solution with which substrate surfaces can be cleaned. Piranha solution is typically used in the microelectronics industry, and also in laboratory settings to clean glassware. 4 is used in petroleum refining, for example as a catalyst for the reaction of isobutane with isobutylene to give isooctane, a compound that raises the octane rating of gasoline (petrol). Sulfuric acid is also often used as a dehydrating or oxidising agent in industrial reactions, such as the dehydration of various sugars to form solid carbon. Acidic drain cleaners usually contain sulfuric acid at a high concentration which turns a piece of pH paper red and chars it instantly, demonstrating both the strong acidic nature and dehydrating property. Sulfuric acid at high concentrations is frequently the major ingredient in acidic drain cleaners which are used to remove grease, hair, tissue paper, etc. Similar to their alkaline versions, such drain openers can dissolve fats and proteins via hydrolysis. Moreover, as concentrated sulfuric acid has a strong dehydrating property, it can remove tissue paper via dehydrating process as well. Since the acid may react with water vigorously, such acidic drain openers should be added slowly into the pipe to be cleaned. John Dalton's 1808 sulfuric acid molecule shows a central sulfur atom bonded to three oxygen atoms, or sulfur trioxide, the anhydride of sulfuric acid. The study of vitriol, a category of glassy minerals from which the acid can be derived, began in ancient times. Sumerians had a list of types of vitriol that they classified according to the substances' color. Some of the earliest discussions on the origin and properties of vitriol is in the works of the Greek physician Dioscorides (first century AD) and the Roman naturalist Pliny the Elder (23–79 AD). Galen also discussed its medical use. Metallurgical uses for vitriolic substances were recorded in the Hellenistic alchemical works of Zosimos of Panopolis, in the treatise Phisica et Mystica, and the Leyden papyrus X. Medieval Islamic era alchemists, Jābir ibn Hayyān (c. 721 – c. 815 AD, also known as Geber), Razi (865 – 925 AD), and Jamal Din al-Watwat (d. 1318, wrote the book Mabāhij al-fikar wa-manāhij al-'ibar), included vitriol in their mineral classification lists. Ibn Sina focused on its medical uses and different varieties of vitriol. Muhammad ibn Zakariya al-Razi (854–925) is credited with being the first to produce sulfuric acid. Sulfuric acid was called "oil of vitriol" by medieval European alchemists because it was prepared by roasting "green vitriol" (iron(II) sulfate) in an iron retort. There are references to it in the works of Vincent of Beauvais and in the Compositum de Compositis ascribed to Saint Albertus Magnus. A passage from Pseudo-Geber´s Summa Perfectionis was long considered to be a recipe for sulfuric acid, but this was a misinterpretation. 3, which combines with water to produce sulfuric acid. In 1736, Joshua Ward, a London pharmacist, used this method to begin the first large-scale production of sulfuric acid. In 1746 in Birmingham, John Roebuck adapted this method to produce sulfuric acid in lead-lined chambers, which were stronger, less expensive, and could be made larger than the previously used glass containers. This process allowed the effective industrialization of sulfuric acid production. After several refinements, this method, called the lead chamber process or "chamber process", remained the standard for sulfuric acid production for almost two centuries. 4, which was oxidized by further heating in air to form iron(III) sulfate, Fe2(SO4)3, which, when heated to 480 °C, decomposed to iron(III) oxide and sulfur trioxide, which could be passed through water to yield sulfuric acid in any concentration. However, the expense of this process prevented the large-scale use of concentrated sulfuric acid. In 1831, British vinegar merchant Peregrine Phillips patented the contact process, which was a far more economical process for producing sulfur trioxide and concentrated sulfuric acid. Today, nearly all of the world's sulfuric acid is produced using this method. Drops of 98% sulfuric acid char a piece of tissue paper instantly. 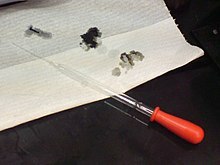 Carbon is left after the dehydration reaction staining the paper black. Sulfuric acid is capable of causing very severe burns, especially when it is at high concentrations. In common with other corrosive acids and alkali, it readily decomposes proteins and lipids through amide and ester hydrolysis upon contact with living tissues, such as skin and flesh. In addition, it exhibits a strong dehydrating property on carbohydrates, liberating extra heat and causing secondary thermal burns. Accordingly, it rapidly attacks the cornea and can induce permanent blindness if splashed onto eyes. If ingested, it damages internal organs irreversibly and may even be fatal. Protective equipment should hence always be used when handling it. Moreover, its strong oxidizing property makes it highly corrosive to many metals and may extend its destruction on other materials. Because of such reasons, damage posed by sulfuric acid is potentially more severe than that by other comparable strong acids, such as hydrochloric acid and nitric acid. Sulfuric acid must be stored carefully in containers made of nonreactive material (such as glass). Solutions equal to or stronger than 1.5 M are labeled "CORROSIVE", while solutions greater than 0.5 M but less than 1.5 M are labeled "IRRITANT". 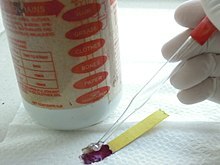 However, even the normal laboratory "dilute" grade (approximately 1 M, 10%) will char paper if left in contact for a sufficient time. The standard first aid treatment for acid spills on the skin is, as for other corrosive agents, irrigation with large quantities of water. Washing is continued for at least ten to fifteen minutes to cool the tissue surrounding the acid burn and to prevent secondary damage. Contaminated clothing is removed immediately and the underlying skin washed thoroughly. Preparation of the diluted acid can be dangerous due to the heat released in the dilution process. To avoid splattering, the concentrated acid is usually added to water and not the other way around. Water has a higher heat capacity than the acid, and so a vessel of cold water will absorb heat as acid is added. Also, because the acid is denser than water, it sinks to the bottom. Heat is generated at the interface between acid and water, which is at the bottom of the vessel. Acid will not boil, because of its higher boiling point. Warm water near the interface rises due to convection, which cools the interface, and prevents boiling of either acid or water. In contrast, addition of water to concentrated sulfuric acid results in a thin layer of water on top of the acid. Heat generated in this thin layer of water can boil, leading to the dispersal of a sulfuric acid aerosol or worse, an explosion. Preparation of solutions greater than 6 M (35%) in concentration is most dangerous, because the heat produced may be sufficient to boil the diluted acid: efficient mechanical stirring and external cooling (such as an ice bath) are essential. Reaction rates double for about every 10 degree Celsius increase in temperature. Therefore, the reaction will become more violent as dilution proceeds, unless the mixture is given time to cool. Adding acid to warm water will cause a violent reaction. On a laboratory scale, sulfuric acid can be diluted by pouring concentrated acid onto crushed ice made from de-ionized water. The ice melts in an endothermic process while dissolving the acid. The amount of heat needed to melt the ice in this process is greater than the amount of heat evolved by dissolving the acid so the solution remains cold. After all the ice has melted, further dilution can take place using water. 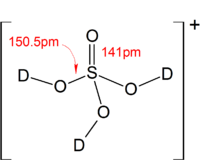 The main occupational risks posed by this acid are skin contact leading to burns (see above) and the inhalation of aerosols. Exposure to aerosols at high concentrations leads to immediate and severe irritation of the eyes, respiratory tract and mucous membranes: this ceases rapidly after exposure, although there is a risk of subsequent pulmonary edema if tissue damage has been more severe. At lower concentrations, the most commonly reported symptom of chronic exposure to sulfuric acid aerosols is erosion of the teeth, found in virtually all studies: indications of possible chronic damage to the respiratory tract are inconclusive as of 1997. Repeated occupational exposure to sulfuric acid mists may increase the chance of lung cancer by up to 64 percent. In the United States, the permissible exposure limit (PEL) for sulfuric acid is fixed at 1 mg/m3: limits in other countries are similar. There have been reports of sulfuric acid ingestion leading to vitamin B12 deficiency with subacute combined degeneration. The spinal cord is most often affected in such cases, but the optic nerves may show demyelination, loss of axons and gliosis. Diethyl ether – also known as "sweet oil of vitriol"
^ a b c Haynes, William M. (2014). CRC Handbook of Chemistry and Physics (95 ed.). CRC Press. p. 4–92. ISBN 9781482208689. Retrieved 18 November 2018. ^ a b c d NIOSH Pocket Guide to Chemical Hazards. "#0577". National Institute for Occupational Safety and Health (NIOSH). ^ a b c d Zumdahl, Steven S. (2009). Chemical Principles 6th Ed. Houghton Mifflin Company. p. A23. ISBN 978-0-618-94690-7. ^ a b c "Sulfuric acid". Immediately Dangerous to Life and Health Concentrations (IDLH). National Institute for Occupational Safety and Health (NIOSH). ^ a b c "Sulfuric acid safety data sheet" (PDF). arkema-inc.com. Archived from the original (PDF) on 17 June 2012. Clear to turbid oily odorless liquid, colorless to slightly yellow. ^ a b c d "Sulfuric acid – uses". dynamicscience.com.au. Archived from the original on 9 May 2013. ^ a b "BASF Chemical Emergency Medical Guidelines – Sulfuric acid (H2SO4)" (PDF). BASF Chemical Company. 2012. Retrieved 18 December 2014. ^ a b Chenier, Philip J. (1987). Survey of Industrial Chemistry. New York: John Wiley & Sons. pp. 45–57. ISBN 978-0-471-01077-7. ^ a b "Sulphuric acid drain cleaner" (PDF). herchem.com. Archived from the original (PDF) on 29 October 2013. ^ a b "Sulfuric Acid". The Columbia Encyclopedia (6th ed.). 2009. Retrieved 16 March 2010. ^ a b c "Sulphuric acid". Encyclopædia Britannica. 26 (11th ed.). 1910–1911. pp. 65–69. ^ "Sulfuric acid" (PDF). Determination of Noncancer Chronic Reference Exposure Levels Batch 2B December 2001. 2001. Retrieved 1 October 2012. ^ "Sulfuric Acid 98%" (PDF). rhodia.com. 2009. Retrieved 2 July 2014. ^ "Ionization Constants of Inorganic Acids". .chemistry.msu.edu. Retrieved 30 May 2011. ^ sulfuric acid on sugar cubes chemistry experiment 8. Old Version. YouTube. Retrieved on 2011-07-18. ^ Housecroft, Catherine E.; Sharpe, Alan G. (2008). "Chapter 16: The group 16 elements". Inorganic Chemistry, 3rd Edition. Pearson. p. 523. ISBN 978-0-13-175553-6. ^ Kinney, Corliss Robert; Grey, V. E. (1959). Reactions of a Bituminous Coal with Sulfuric Acid (PDF). Pennsylvania State University. ^ Pelletreau, K.; Muller-Parker, G. (2002). "Sulfuric acid in the phaeophyte alga Desmarestia munda deters feeding by the sea urchin Strongylocentrotus droebachiensis". Marine Biology. 141 (1): 1–9. doi:10.1007/s00227-002-0809-6. ^ a b Kremser, S.; Thomson, L.W. (2016). "Stratospheric aerosol—Observations, processes, and impact on climate" (PDF). Reviews of Geophysics. 54 (2): 278–335. Bibcode:2016RvGeo..54..278K. doi:10.1002/2015RG000511. ^ Orlando, T. M.; McCord, T. B.; Grieves, G. A. (2005). "The chemical nature of Europa surface material and the relation to a subsurface ocean". Icarus. 177 (2): 528–533. Bibcode:2005Icar..177..528O. doi:10.1016/j.icarus.2005.05.009. ^ Jones, Edward M. (1950). "Chamber Process Manufacture of Sulfuric Acid". Industrial and Engineering Chemistry. 42 (11): 2208–2210. doi:10.1021/ie50491a016. ^ (Harm), Benninga, H. (1990). A history of lactic acid making: a chapter in the history of biotechnology. Dordrecht [Netherland]: Kluwer Academic Publishers. p. 4. ISBN 9780792306252. OCLC 20852966. ^ Davenport, William George & King, Matthew J. (2006). Sulfuric acid manufacture: analysis, control and optimization. Elsevier. pp. 8, 13. ISBN 978-0-08-044428-4. Retrieved 23 December 2011. ^ Greenwood, Norman N.; Earnshaw, Alan (1997). Chemistry of the Elements (2nd ed.). Butterworth-Heinemann. p. 653. ISBN 978-0-08-037941-8. ^ Ngo, Christian; Natowitz, Joseph (2016). Our Energy Future: Resources, Alternatives and the Environment. John Wiley & Sons. pp. 418–419. ISBN 9781119213369. ^ Modanlou, Houchang D. (November 2008). "A tribute to Zakariya Razi (865 - 925 AD), an Iranian pioneer scholar" (PDF). Archives of Iranian Medicine. 11 (6): 673–677. PMID 18976043. Retrieved 17 May 2018. Abu Bakr Mohammad Ibn Zakariya al-Razi, known in the West as Rhazes, was born in 865 AD in the ancient city of Rey, Near Tehran. A musician during his youth he became an alchemist. He discovered alcohol and sulfuric acid. He classified substances as plants, organic, and inorganic. ^ Schlosser, Stefan (May 2011). "Distillation – from Bronze Age till today". Retrieved 17 May 2018. Al-Razi (865–925) was the preeminent Pharmacist and physician of his time . The discovery of alcohol, first to produce acids such as sulfuric acid, writing up extensive notes on diseases such as smallpox and chickenpox, a pioneer in ophthalmology, author of first book on pediatrics, making leading contributions in inorganic and organic chemistry, also the author of several philosophical works. ^ Philip J. Chenier (1 April 2002). Survey of industrial chemistry. Springer. pp. 28–. ISBN 978-0-306-47246-6. Retrieved 23 December 2011. ^ Beaumont, JJ; Leveton, J; Knox, K; Bloom, T; McQuiston, T; Young, M; Goldsmith, R; Steenland, NK; Brown, DP; Halperin, WE (1987). "Lung cancer mortality in workers exposed to sulfuric acid mist and other acid mists". J Natl Cancer Inst. 79 (5): 911–21. doi:10.1093/jnci/79.5.911. PMID 3479642. ^ Annex to Form D ("Red List"), 11th Edition, January 2007 (p. 4). International Narcotics Control Board. Vienna, Austria. Wikimedia Commons has media related to Sulfuric acid.